Here you can see a composite satellite photo of two cyclones hitting northern Australia within six hours of each other this week. In the upper left is Cyclone Lam, and in the lower right is Cyclone Marcia. It's beautiful but also terrifying. 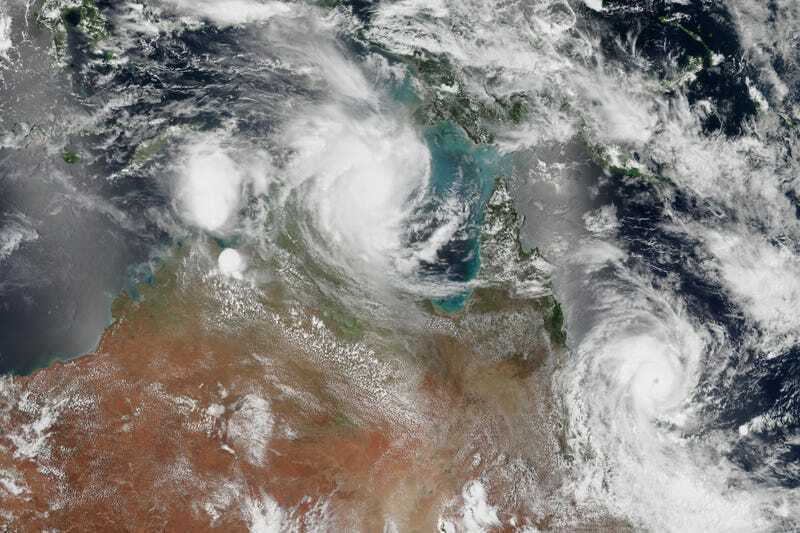 Northern Australia was battered by two potent tropical cyclones within six hours on the same day in February 2015. Cyclone Lam made landfall on the north-central coast near Milingimbi (about 400 kilometers east of Darwin) around 2 a.m. Australian central time on February 19. Cyclone Marcia made landfall on the east coast of Queensland near Rockhampton and Yeppoon around 8 a.m. local time on February 19. At landfall, Lam had estimated wind speeds of approximately 165 kilometers (105 miles) per hour; Marcia came ashore with winds of 205 kilometers (125 miles) per hour. Marcia briefly reached category 5, only the sixth storm of that strength since records have been kept in Australia. According to meteorologist and blogger Jeff Masters, few major cyclones have made it so far south (around latitude 22°S) down the Australian coast. The Visible Infrared Imaging Radiometer Suite on the Suomi NPP satellite captured this view of the two storms around midday on February 19, 2015. The image is a composite of satellite data from two Suomi NPP passes over the area. As of February 20, no deaths had been reported from the storm, though damage assessments were still to be made in many of the remote towns. Water and power were lost in several areas hit by Lam. Power was knocked out by Marcia for at least 50,000 homes in Queensland.